It’s time for another look at Golden Eagle home sales. Currently, this popular Northeast Tallahassee neighborhood is experiencing it's most active year since 2007, and there are 42 homes for sale in Golden Eagle Plantation in the Tallahassee MLS. As one of our favorite golf course subdivisions, Golden Eagle's core values of gated community and country club living make it a top destination for the high end homebuyer in Tallahassee. First of all, you can get detailed information on each sale from either the map below or the table at the end of this post (people who subscribe to the Tallahassee Real Estate Blog by email will need to click through to use the Map). Just click on the red dots on the map to quickly see sale prices, home sizes, and values. The average sales price for homes sold in Golden Eagle Plantation in 2011 is $477K, up 2% from $466K in 2010. This is not a sign of real estate appreciation, as we will observe in the second real estate graph. It is exciting to note that Golden Eagle posted its first $1M+ sale last month, which is the first one since October 2009. 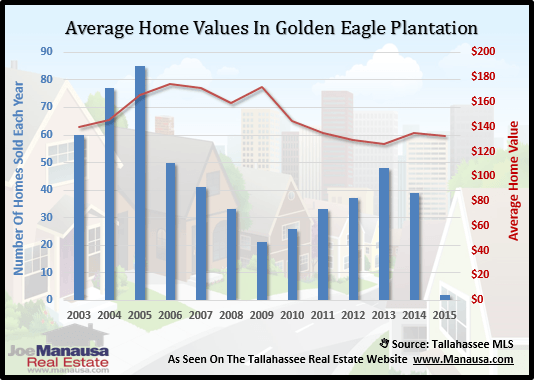 Home values are still on the decline in Golden Eagle Plantation, as the $135 per square foot average this year is 7% lower than the $144 average recorded in 2010. 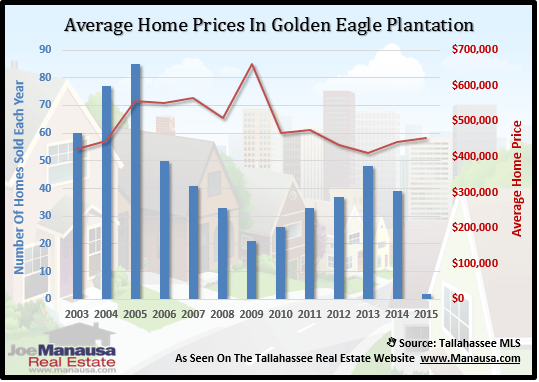 The abundance of supply of high end homes in the Tallahassee MLS will continue to exert pressures on home prices in Golden Eagle for quite some time. If you want to sell a home in Golden Eagle Plantation, take a look at our targeted home selling plan. There is no reason why your home cannot sell, even with the abundance of inventory that will exist for several more years. Remember, it does not take luck to sell a home, rather it takes the right marketing plan combined with the right asking price to produce a buyer in today's competitive real estate market.